The house design Mandalay 185 is the flagship of this Series. 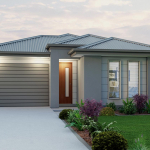 This great value 4 bedroom home features a double lockup garage, ensuite with Walk in robe. This home is perfect for lifestyle living. With its open plan living it will allow you to entertain with ease. The main bathroom features a modern stand alone bath. With an ensuite that keeps up with the modern feature of a walk in double shower.